Tired of unreturned emails and phone calls? Trying to find information about a trip around the Pacific and can't seem to get a timely answer? Call us. We answer our phone, respond to every email, and can help set up your next South Pacific adventure. Our flagship vessel in Vava 'u Tonga is Mariah, a magnificent Catana 582. 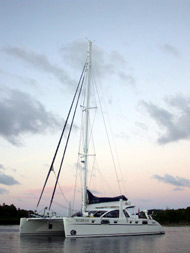 Built for long distance ocean passages in luxury this catamaran reaches a new high in comfort and service in Tonga. Large self feathering props for easy docking and quick passages under sail. A five star master’s cabin comprising one complete hull with a separate, and private commode, washing machine, large bed, full shower facilities, and even a computer work station. Twelve volt and 110 volt electrical distribution throughout with 220 volt available for charging cell phones etc. Lady-A is an amazing 80 foot aluminum sailing matching. The spacious interior and three luxury cabins with private head and shower make this a desirable vessel anywhere in the world. 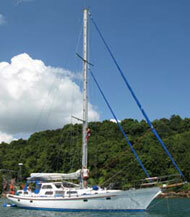 Now Lady-A can be your sailing platform for Tonga and the surrounding South Pacific. Dive and swim with the whales? Tonga is one of the only countries that allows, and even encourages swimming with the whales. The whale photos taken underwater on this site are real. Come have a face to face encounter with one of the world's largest creatures. We can help book day adventures or even help set up a vacation on the only overnight whale watching boat in Tonga, Jocara. That's right, book up to six passengers to spend a week communing with the humpback whale population. Sleeping near the pods and hearing whale song reverberating through the hull at night, viewing the first whales of the day while breakfasting on deck, and possibly finding some calm friendly whales for an in-the-water encounter. Want something cheap? Looking for inexpensive accommodations in Tonga? Want an easy way to see the bays, enjoy the water, and maintain your privacy? Want to live your own adventure? We may have the boat. Comfortably Numb, a Miura 30, built in South Africa, sailed to Tonga on her own bottom and now used by a local agency as a bareboat charter, or take a knowledgeable local Tongan skipper with you. Comfortably Numb is fully stocked with a stove, pots, pans, linen, snorkeling gear and a row dingy. 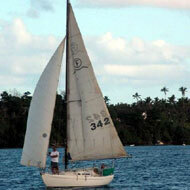 26ft bareboat - Folk boat "Damn"
Spend your Vava'u vacation sailing the pristine waters of Vava'u, Tonga aboard the yacht "Damn". This bottom of the price range, 26 foot fiberglass Folk Boat is fully stocked with a stove, pots, pans, linen, snorkeling gear and a row dingy. "Damn" is ideal for two people and we can help you find the perfect spots for a relaxing getaway. We can also assist you with diving and a dozen other activities during your stay in Vava'u. Want to help save the whales? Want to help save the whales? Take a whale watching tour. International whale watching tourism is a multi billion dollar a year industry. That is enough tourist dollars to produce political might. When you come to Tonga and swim with the whales you are spending your tourist dollar in a way that helps make an economic impact to an island community in sustainable way. At the end of the year when money is counted and whaling nations are handing out large sums to gain votes in the International Whaling Commission your dollar may be the deciding vote. Call now to book for the 2010 season.